THE FALSE AND THE FAIR present their new EP, The Space In Between. The five-song collection sees the Dublin band distilling folk influences and wistful lyricism through the pulsing rhythms and raw guitar work fans have come to expect. In that moment a band was born. The first to join was Adam, shortly followed by his kindred spirit and psychic twin Jacob. Together their bass and drums formed the beating heart of the band, the pulse that brought Tommy’s songs to life. Cormac’s mellow guitar tone was the final piece of the puzzle, providing the indefinable emotional lift these songs needed to truly soar. 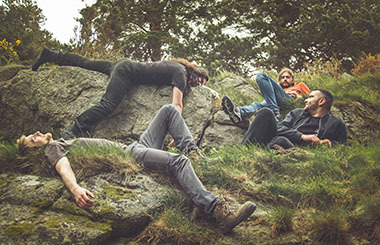 Once assembled, The False and the Fair wove their psychedelic web around Tommy’s distinctive vocals and folk songwriting to create a uniquely atmospheric blend of alternative rock. The band soon became known for their live shows, with songs running the gamut from manic energy to somber reflection and back again at a moment’s notice.